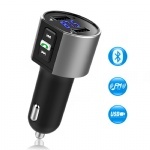 Easy to Start Up: Plug it into the cigarette lighter socket, turn your car FM radio on, find an blank radio station, and match it to this transmitter; Pair it with your phone via Bluetooth--Enjoy music in your smartphone through the car’s stereo system (Auto-connect to last paired device). 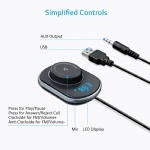 Superb Clear Sound: Increased noise isolation circuit design, and CVC noise cancellation technology, grant lossless clear stereo sound, streaming music & phone call without any road noise and echoes; Seamlessly switches between incoming calls and music. 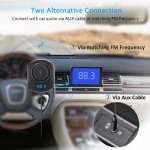 One Button Control: Supports AVRCP technology--Play/Pause, Previous/Next song, Volume up/down; Answer/Reject calls, and Siri activation; Digital Display helps to adjust FM transmission frequency easily (87.5-108 MHz). 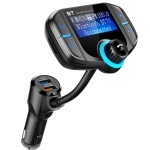 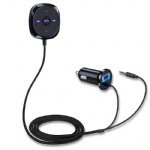 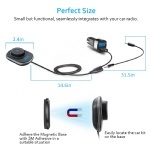 Broad compatibility: Bluetooth 4.2, works with almost all Bluetooth devices; Compatible with all cars no matter whether it is with AUX port or not--You can connect this kit with car audio via AUX cable or matching FM frequency. 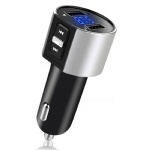 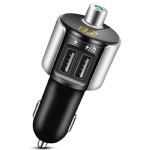 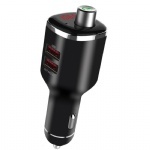 USB Car Charger Ports: Comes with dual USB charging ports 5V/2.1A, able to charge additional devices conveniently at the same time; 12 Months Guarantee from Comsoon, and professional after-sales services!